The K League Challenge moves into the 38th round (out of 44) of the 2015 season. The highlight game of the this round of games is the late Saturday clash between 4th placed Seoul E-Land FC and bottom side Chungju Hummel. With the top 3 all not playing this weekend it gives Seoul a chance to make up some ground on their playoff placed rivals. Chungju Hummel on the other hand are just trying not to finish bottom. The league table is lead by Daegu who now have a 6 point gap at the top. 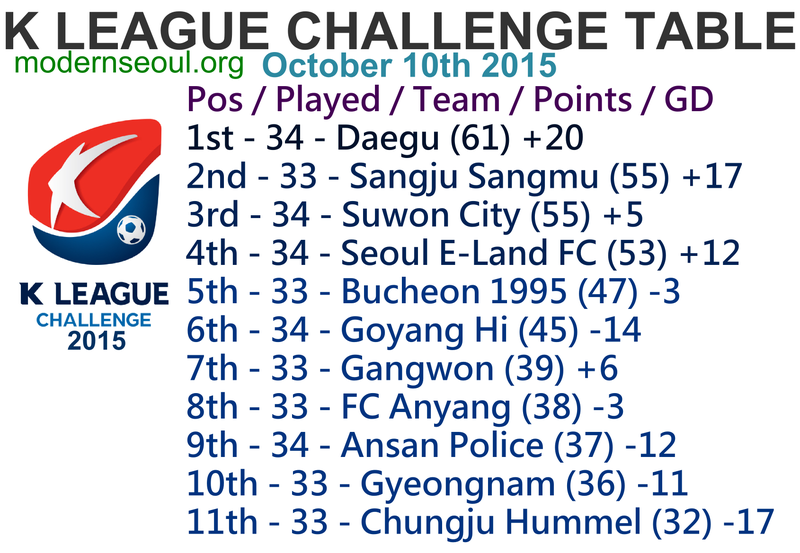 They are just ahead of Sangju Sangmu, Suwon City and Seoul E-Land who make up the playoff places. Bucheon and Goyang are just behind them. Gangwon, FC Anyang and Ansan are still slightly in the playoff race in 7th-9th. Gyeongnam are 10th and finally bottom club is now Chungju Hummel who slipped down to the foot of the table, but are only a 4 points adrift. Both Goyang and Ansan only have a single win each from the last 5 games. Also Goyang have the 2nd weakest defensive record in the league. Whilst Ansan have the 2nd weakest strike force. A draw seems likely. Gyeongnam have 2 wins from 3 games. Whilst Anyang have lost their last 3 games on the bounce. Gyeongnam will come into this one favorites. Seoul are unbeaten in 5, with 2 wins and 3 draws. Bottom club Chungju have lost their last 2 games and are currently 4 points behind 10th placed Gyeongnam. Seoul will be favorites here. Bucheon have won 3 and lost 2 of their last 5 games, highlighting their inconsistency. Gangwon have lost 2 and draw 2 of their previous 4 games and a playoff place seems unlikely now. This will be close but Bucheon will be slight favorites. Predictions Update: 2 correct results but no perfect scores.